Okay, in your own time and when you're ready! No rush... Some three and a half minutes later, the HP Scanjet wheezes its way to the end of our test scan like a fell walker who's just smoked 40 Capstan Full-Strength before tackling Mount Everest. Now there's nothing wrong in trying to keep the cost of a product down, but this budget scanner from HP takes cost-cutting to a new low - and it shows. On paper, the 1,200dpi and 48-bit colour resolution looks pretty good, but in practice the Scanjet 2400 produces blue and red fringed scans that match the toy-like build quality of this modest-looking little flatbed. 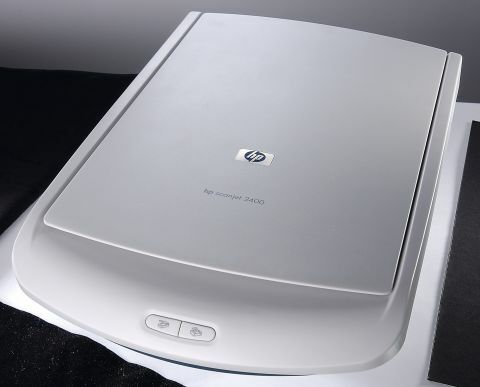 Sadly, the software bundle that comes with HP's Scanjet range isn't much better than the scanner itself. HP was one of the first companies to support scanners in OS X, and some fundamental errors were made back in those early days. The poor interface of the scanning software and the lack of an intuitive workflow make HP scanners a bit of a chore to use. Add in the sluggishness of the performance and you have a scanner that wouldn't really be very good value if it were free. That may sound a little harsh, but consider this: if your scanner takes around three times as long to scan an image as anyone else's, then unless time means absolutely nothing to you, this scanner will actually end up costing you money in the form of lost productivity.